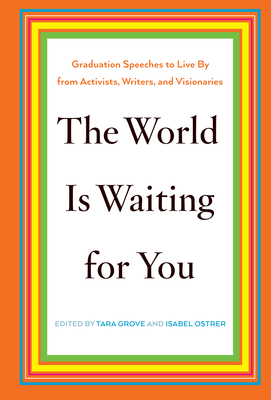 With contemporary graduation speeches that dissect the world as it is and imagine what it could be, The World Is Waiting for You brings forth eighteen courageous figures who have dared to transform the podium into a pulpit for championing peace, justice, protest, and a better world. "The voices of conformity speak so loudly. Don't listen to them," acclaimed author and award-winning journalist Anna Quindlen cautioned graduates of Grinnell College. Jazz virtuoso and educator Wynton Marsalis advised new Connecticut College alums not to worry about being on time, but rather to be in time--because "time is actually your friend. He don't come back because he never goes away." And renowned physician and humanitarian Paul Farmer revealed at the University of Delaware his remarkable discovery--the new disease Empathy Deficit Disorder--and assured the commencers it could be cured. The prescient, fiery feminism of Gloria Steinem sits parallel to that of celebrated writer Ursula K. Le Guin, who asks, "What if I talked like a woman right here in public?" Nobelist and novelist Toni Morrison sagaciously ponders how people centuries from now will perceive our current times, and Pulitzer Prize winner Barbara Kingsolver asks those born into the Age of Irony to "imagine getting caught with your Optimism hanging out" and implores us always to act and speak the truth. The World Is Waiting for You speaks to anyone who might take to heart the advice of Planned Parenthood president Cecile Richards--"life as an activist, troublemaker, or agitator is a tremendous option and one I highly recommend"--and is the perfect gift for all who are ready to move their tassels to the left. Tara Grove is the education editor at The New Press. She is a graduate of the University of Pennsylvania and lives in New York City. Isabel Ostrer is a recent graduate of Harvard University and lives in Cambridge, Massachusetts. They both went to college to figure out how they could make the world a more humane place to live.